David Owen’s new book argues that we already know how to prevent environmental catastrophe—we just don’t like the answers. What we perceive to be “easy” environmental solutions—energy efficiency, natural gas, high speed rail, and even solar panels—won’t actually fix the problems they’re trying to solve. Ultimately, we need to reduce our consumption of limited resources, author David Owen argues in his new book, The Conundrum. The conundrum being that we already know how to reduce consumption; we just don’t like the answers. Owen, who first argued that efficiency can’t solve our energy woes in a 2010 New Yorker article about the Jevons Paradox, the problem is thus: When we make things (like energy) cheaper we end up using more of them. That article spurred a lot of debate; and The Conundrum picks up where it left off. In fact, living “green” may mean changing a lot of habits we’ve come to take for granted. To reduce consumption, Owen suggests, we need to drive less, travel less, eat less meat, buy less stuff, and live in smaller homes. He calls the automobile “Global Environmental Enemy No. 1,” describes income inequality as “a global generator of environmental harm,” and declares that “dense, efficient, intelligently organized cities are the future of the human race.” In fact, Owen says, the whole concept of permanent economic growth is “the equivalent of believing in perpetual-motion machines and Ponzi schemes.” All of which means we’ve got a lot more to change than just the brand of paper towels we use. Owen concedes that efficiency and innovation aren’t bad in and of themselves; efficiency and innovation can help us live well on less. But we still have to reduce our overall consumption. 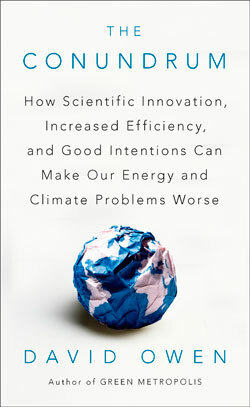 And that’s the trick: “Turning reduced waste into reduced consumption is a trick we haven’t yet figured out,” he writes, adding, “almost all of the serious environmental problems we face now are the direct or indirect consequences of what seemed, originally, like awfully good ideas.” (Ahem, geoengineers.) Indeed, efficiency and innovation have led to unintended consequences in the past. As evidence Owen points to the invention of transistors in 1947, which at the time was seen as “a brilliant breakthrough in efficiency, dematerialization, and decarbonization.” But over time, transistors enabled the explosion of consumer electronics—which today use huge quantities of energy doing tasks that were once unimaginable. Owen acknowledges that reducing consumption is a tough sell. That’s in part why energy efficiency is oft-touted by politicians, he suggests, while measures designed to cut consumption by increasing costs—like carbon taxes—are beloved mostly by economists. In this sense, he says, the 2008 recession “put time back on the carbon clock” (about four days’ worth). But his argument stops short of offering solutions about how to get people excited about cutting back consumption during a time when they’re already feeling the pinch. How likely would the 9 billion human residents of the world be, in the absence of any signs of worsening climate stress, to permanently endure, decade after decade, the continuing sacrifices required to maintain the new status quo—the halted growth, the forgone consumption, the reduced mobility, the population control, the willing abandonment of vast known reserves of fossil fuels? It’s a sobering end to a book that’s full of hard questions and uncomfortable answers. The Conundrum should unsettle anyone who assumes their lifestyle is eco-friendly; whether that’s enough to prompt change, though, might be the toughest question of all. How Fuel Efficient are Modern Passenger Cars?